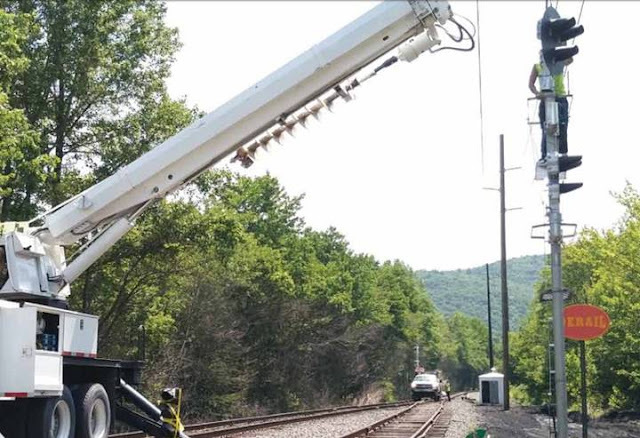 In what could pass for a piece of positive signaling news these days, Norfolk Southern is actually expanding it's Cab Signal System territory by installing cabs on the former PRR/Conrail Conemaugh Line between CP-KISKI and either CP-ETNA or CP-PENN. 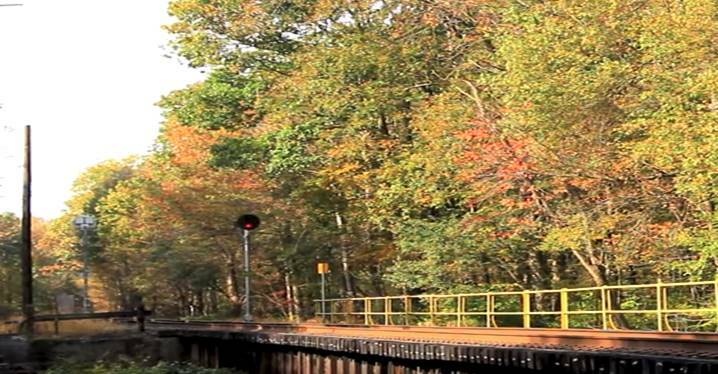 For those who didn't know, the Conemaugh Line, a low grade main line running along the Conemaugh River between Johnstown and Pittsburgh, PA, was used by the PRR to test the concept of using cab signals without fixed wayside signals. The system was installed between what is now CP-CONPIT on the Pittsburgh Line and CP-KIKSI, where the line had a wye junction with the Allegheny River line into the oil and coal fields on Western, PA. Because the PRR did not want to equip these Western PA pool engines with cab signals, the remainder of the Conemaugh Line was conventionally signaled. Westbound signals at CP-CONPIT with the original Rule 280b 'C' lamps installed. 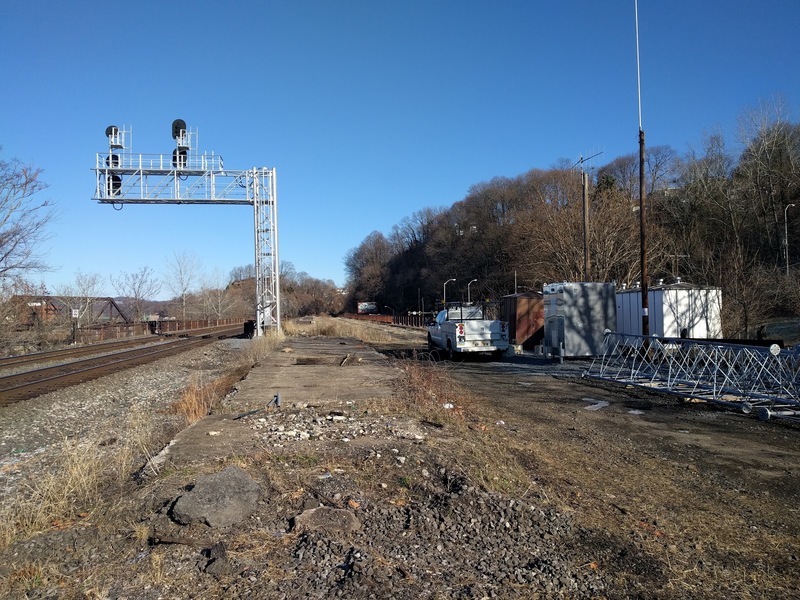 While Conrail expanded it's cab signal territory in the 90's, adding the Boston Line, and the Fort Wayne/Cleveland Line corridor between Conway Yard and Cleveland, NS has been content with the status quo, perhaps in spite or because of the PTC mandate. 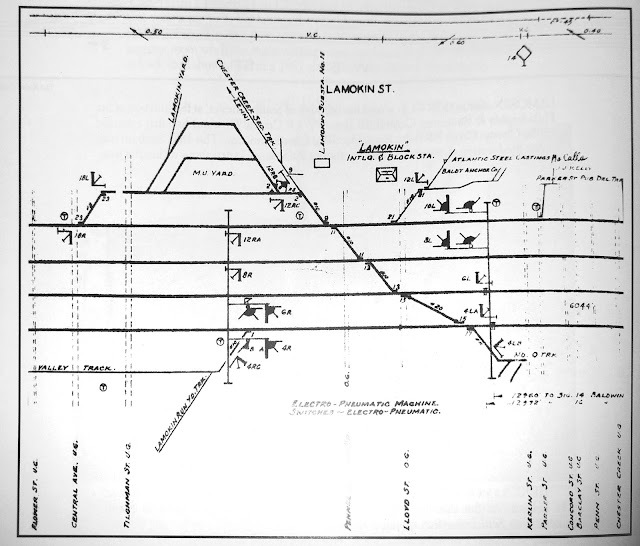 Plans to convert the Port Road and Pittsburgh Lines to waysideless operation did represent one type of change, it would not actually add any additional CSS track miles. Same cab signals, just different packaging. Well while I was in Pittsburgh recently I popped byCP-SHARP, which had been rebuilt from its Penn Central predecessor along with CP-ETNA as part of a siding expansion project. 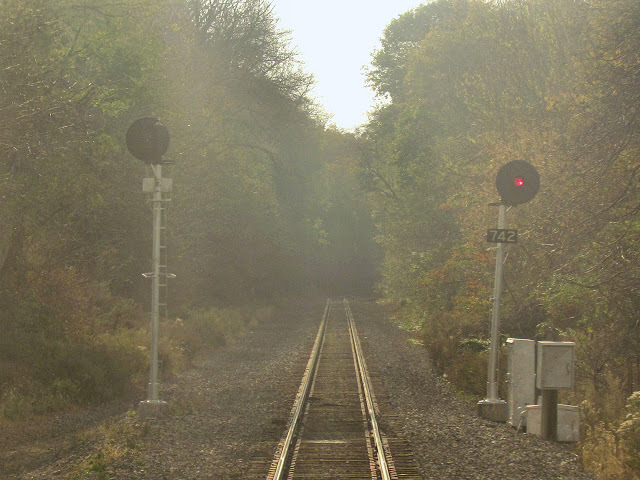 You could say I was surprised when I saw new signals going up with the telltale 'C' lamps on them, indicating that since the Oil City line was long abandoned, NS saw no reason not to bring its cab signaled trains all the way to Pittsburgh on the alternate route. As you can see the new 'C' equipped mast will lack the third head included on the existing mast as Medium Approach Medium is not considered necessary where a cab signal can be held at Approach Medium after a train diverges over Medium Clear. This is one of the few circumstances where a PTC related re-signaling project has actually brought about more interesting signaling. While I was not able to stop by CP-ETNA to see if the Rule 562 operation stopped there or would continue to CP-PENN, I suspect it will stop at ETNA, at least until the Conway Corridor is fully re-signaled. 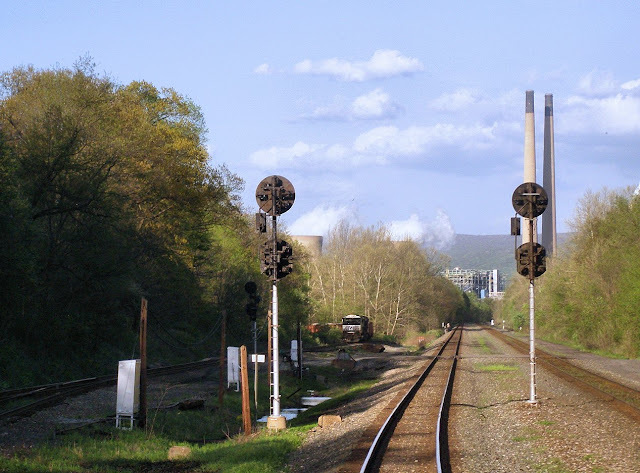 Just got back from a road trip and to my disappointment I discovered that the remaining Lehigh Valley RR signals had been removed from the lower half of the Lehigh Line between CP-67 and Bethlehem, PA. Caught up in this sweep were the former CNJ/Reading interlockings of CP-ALLEN, CP-CANAL and CP-JU (previously re-signaled by Conrail). 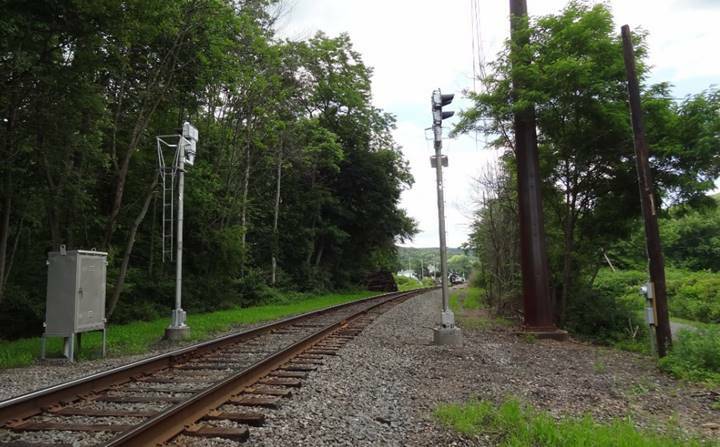 The project had been underway for well over a year and I had taken the opportunity to document as much as I could, however I missed the two LVRR automatic signal locations at MP 71 and MP 74 as when I passed them by last October they did not appear to be under threat. The former CP-RICHARDS was replaced by a new crossover a few miles to the west as once again the block lengths were stretched to reduce the number of signaling locations. Rule 251 was then replaced by 261 between CP-RICHARDS and CP-BETHLEHEM. I was also disappointed to have missed documenting CP-JU. 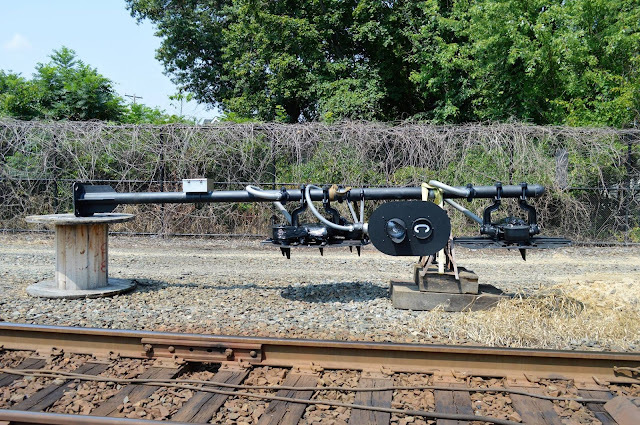 Although the original CJU plant with pneumatic points and signal bridges had been replaced by Conrail, it was nevertheless a great example of Conrail signaling, complete with searchlight dwarfs. 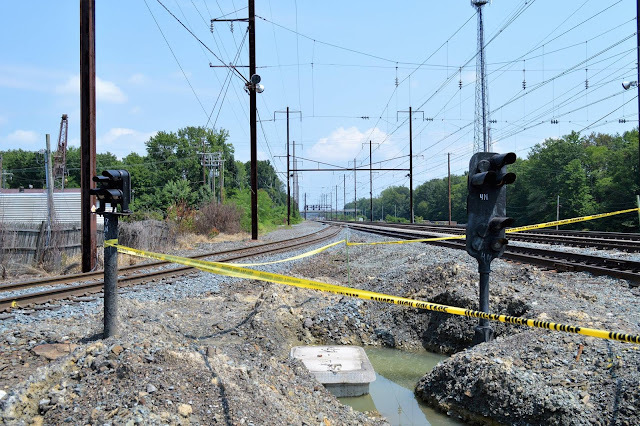 Finally, the odd arrangement between CP-EASTON and CP-PHILLIPSBURG wherein trains crossing the Delaware River could not get an Approach indication. Signals would only display Clear or Restricting for following movements. This was possibly due to some previous restriction regarding trains being stopped on the bridge, however NS appears to have remedied the problem and trains can get Approach at both locations. 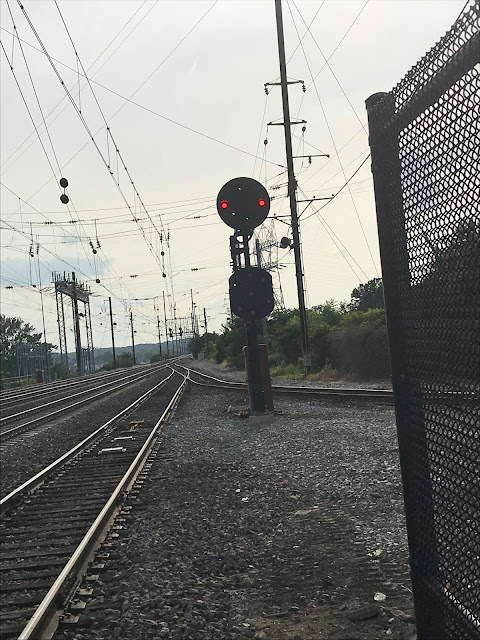 I should also mention that CP-PHILLIPSBURG had already gotten new Darth Vader signals installed within the last 5 years for...reasons. This is yet another lesson about not taking things for granted. If you have the oppurtunity to photo something, do it ASAP, even if you think you'll have time enough to catch them "later". 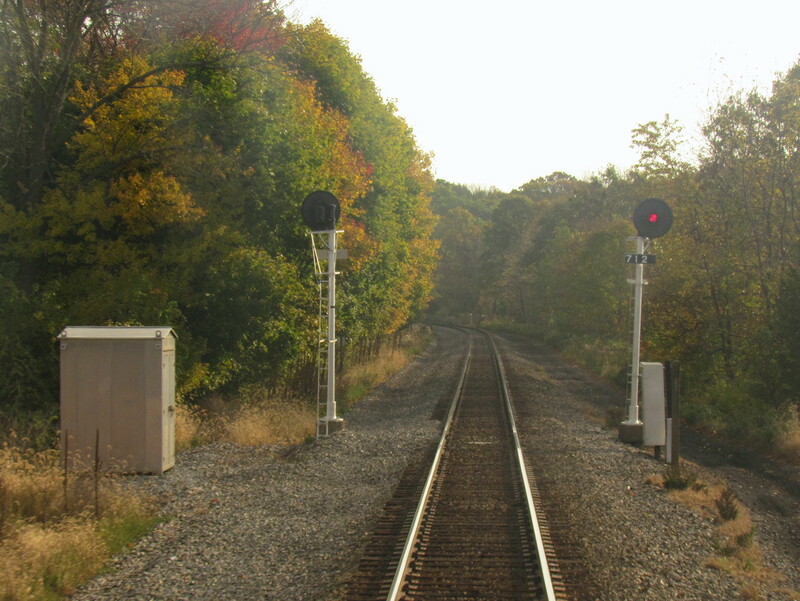 If you would to see what I was able to document my Lehigh Line Amtrak Autumn Express photos can be found here and my Easton Roadtrip photos cam be found here. This topic has come up a few times in other articles, but one of the neat things about non-solid state signaling technologies are the sounds. Relays click, air hisses, motor generators....motor-generate? One of the things I try to do on my documentary trips is capture any interesting sounds that might be escaping from one of the old relay huts or air plants. My digital camera takes video just as well as stills so it doesn't take much extra effort and I then assemble the results into compilation videos for YouTube. The following videos were taken mostly along the PRR Main Line or some of its connecting branches. The sounds can be broken down into the following categories. Air Hiss: Where switch points are operated by air, there is always a hissing leak somewhere. Always. Compressor Chug: When the pressure gets low enough, a compressor trips on. Something Turning: Motor generators or flashing relays typically have rotating parts. When they get worn out, you can hear them. Cab Signal Code Generators: The most common sound I capture, electro-mechanical CSS generators generate pulses of current between 1 and 3 times a second. Code rates are 70 pulses per minute for Approach, 120ppm for Approach Medium and 180ppm for Clear. Generators are typically only active when code is being supplied. The sounds are pretty self explanatory so I won't go into much detail. Part of the fun is trying to determine which cab signal codes you can hear or what that rotating thing is doing inside the relay cabinet. MP 277 automatic signals at Fostoria, PA.
A Great Early CTC Resource! As the few remaining stretches of classic CTC signal gets ground under in favor of lifeless Darth Vaders and wireless links, sometimes I find myself at a loss for information when writing up trip reports or signaling articles. Were the signals installed in the 50's? The 60's? Were they controlled from nearby towers? Dispatching offices? How much has the territory and layout changed since it went in? Getting access to the interlocking sheets from somewhere like Multimodalways is the gold standard, but their collection is largely incomplete, pretty much restricted to the Northeast united States. As you can see, it's not very helpful. However RRSignal.com's factory photo reveals all the details including a date of 1954. 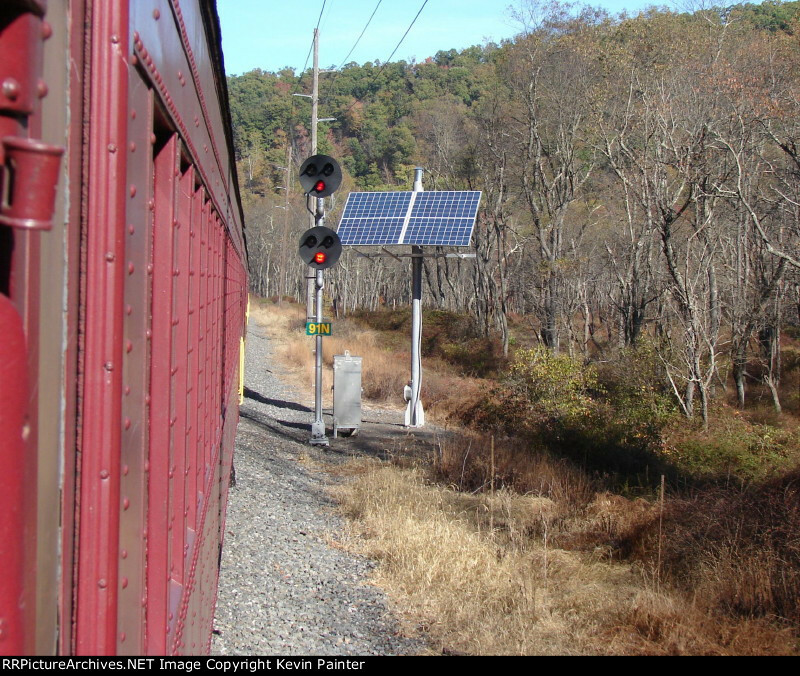 The first generation CTC era of railroads was both visible and invisible. Visible because the signals and relay-interlockings lasted well into the 21st century. 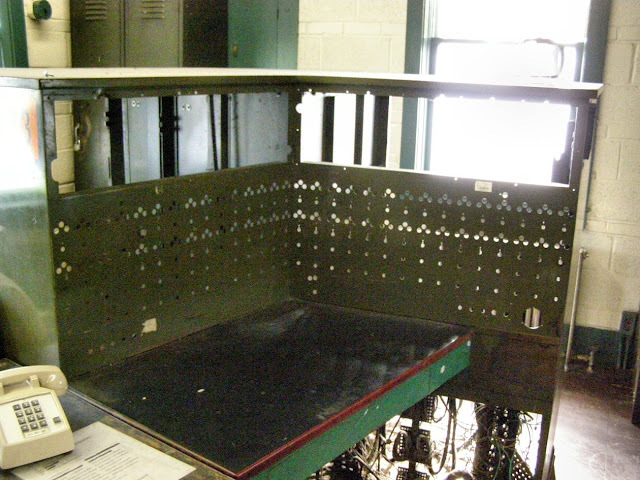 Invisible because the consoles were hidden away in towers and offices long since shipped out to the scrap yard. This archive of photos provides real insight into what was happening to North American signaling after the heyday of the single interlocking tower. Personally I was quite surprise how early many of the installations were as my assumption had always been the 1960's instead of the 1940's or 50's. This is probably due to the PRR being a notorious "late adopter" of CTC. 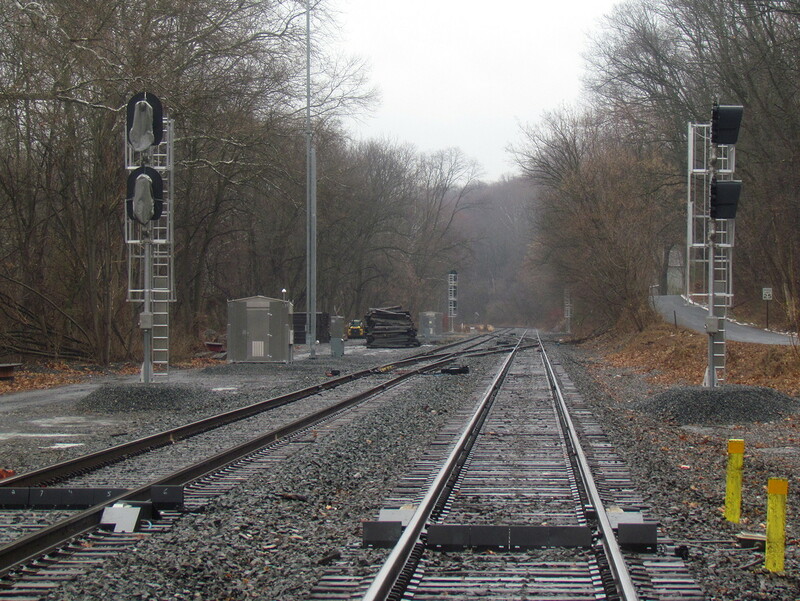 The new interlockings south of Tamaqua are CP-EQUILATERAL (MP 95.2) and CP CLINT (MP 78.2). 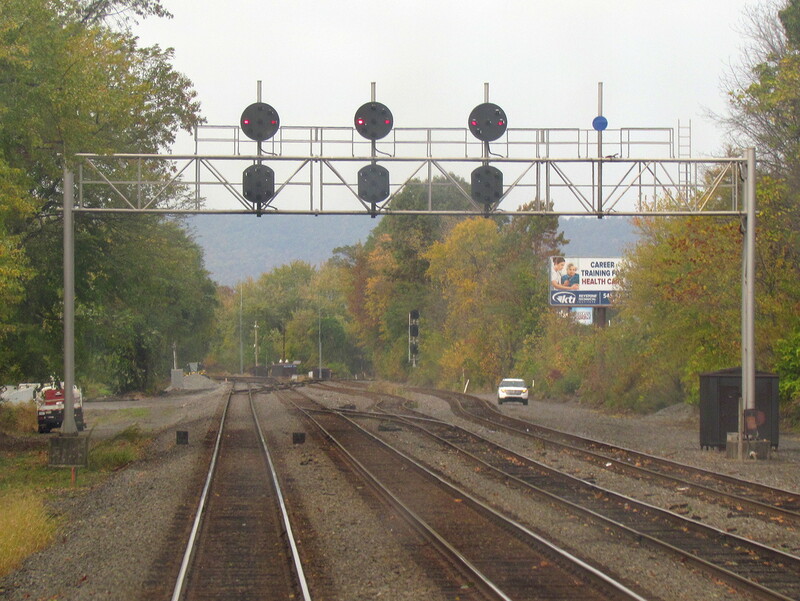 CP-EQUILATERAL is the end of the Tamaqua siding at the site of the old Reading MYRTLE interlocking and CP-CLINT is the entrance to the Rule261 track north of the non-signaled yard complex. However, much to my continued puzzlement, the northbound home signal at CP EQUILATERAL like the southbound CP TAMAQUA home signal is a triple head 9 light wired unit capable of displaying all NORAC aspects. Can’t understand the need for these triples deployment per requirements for right now. Tamaqua end is somewhat understandable with a single slow speed 15 mph switch into either the yard or dark territory branch for R/R/G or R/R/Y aspect but why the real need for the middle head then when R/Y would do? Similarly, Equilateral end is a medium speed Y switch for dual main routing only so why the need for a 3 light lower head. R/G/R or R/R/Y should suffice. Currently, doesn’t make sense. Also, at Equilateral, the southbound home signal adjacent to the now passing track is a dual head mast signal and old main track 1 gets the dwarf application. This arrangement suggests track 2 will soon be employed as the new southbound main at some point but there is no new interlocking at either MBS MIDDLE YARD or MBS LOWER YARD to automatically get trains from the single main track 1 onto track 2 as a routine passing siding application. I just can’t imagine this will continue to be a manual operation with ongoing track upgrade work and those additional heads. The only scenario that makes sense for these deployments is an additional new interlocking for MIDDLE YARD or LOWER YARD. Then, Tamaqua and Equilateral can display various appropriate approach aspects using all 3 heads like Y/R/G. We shall see. It will be interesting to see how the Port Clinton complex just to the south gets treated and signaled. Andy Muller had those old black multi track truss signal bridges put in place bounding the old RDG Port Clinton Interlocking when they were building out he complex. But, more complex trackage has since been added. 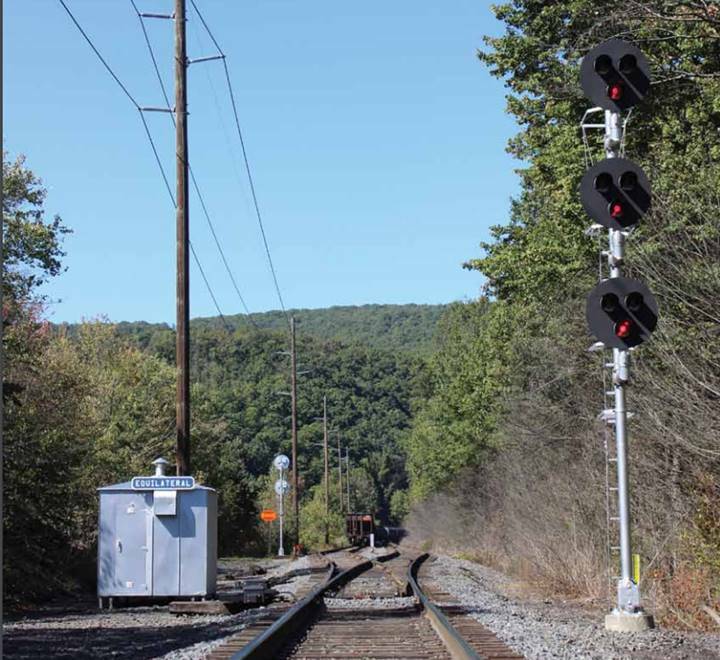 Just the single diversionary route switch between the Tamaqua and Pottsville Branches is currently powered and controlled from within the PC Tower Office. But, is not governed by any signaling to date. Also, wondering if they employ the same treatment shortly before MP 77 where MBS KERNS begins the northbound double track into Port Clinton YL. So, this will all be interesting to follow as well. 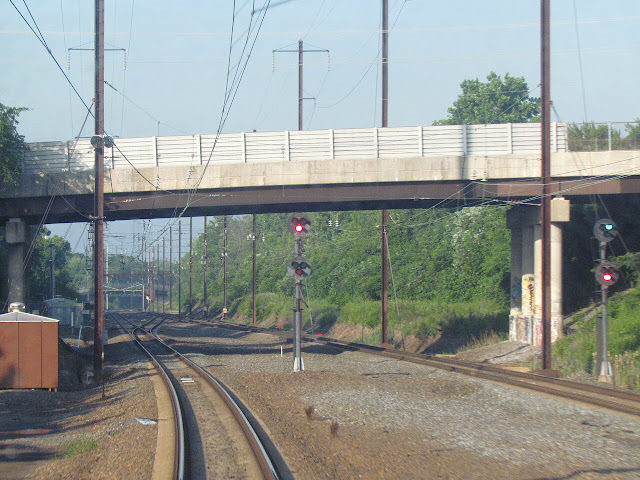 Steam friendly right hand mounted paired mast ABS locations along the Little Schuylkill Branch are at MP 91.5, MP 87.7, MP 84.4, MP 81.1. All are single head type tri-lights with the exception of the south and north bound approach distant signals to CLINT and EQUILATERAL. These are dual head type G’s for approach aspects. Also, of interesting note, the ABS at 91.5 are solar powered due to the remote isolated location and lack of a readily available power supply. 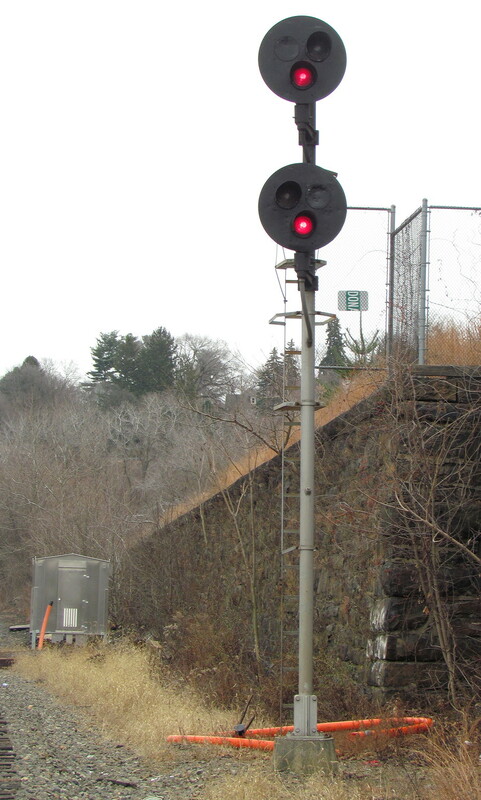 Unfortunately many of the new signal heads are off the modular SafeTrain type, instead of classic US&S TR's or GRS G's or even newer singe housing tri-lights. However this appears to be an availability issue as this off-brand tri-light was spotted at MP 87.7 and the signals at CP-CLINT are indeed of the classic type. More importantly a Reading style sideways 2-lamp signal head was placed at MP 84.4. Apparently some of the ABS signals are displaying an un-Reading *Y* for Advance Approach instead of Y/Y, but I'm not going to complain. I suspect that as the passenger service to North Reading ramps up, the signaling will eventually make its way down in that direction. Starting in 2009, NS began to re-signal the western (northern) Port Road. This started with the former COLA tower CTC area and proceeded south to CP-MIDWAY and then north to Enola Yard with Rule 562 going in to replace the ABS 251 between SHOCKS and STELL. 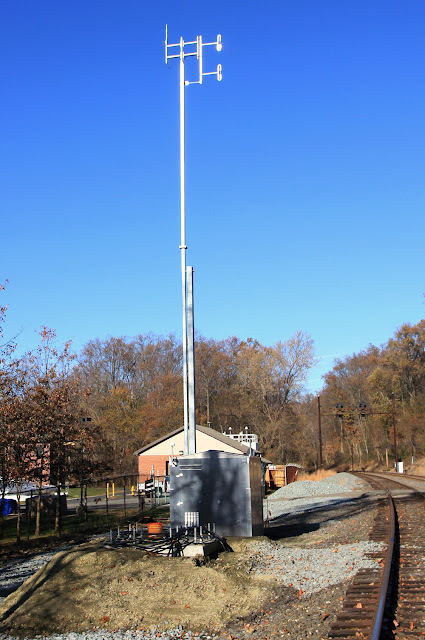 However for some reason instead of applying the same treatment to the line segment between CP-MIDWAY and the Amtrak junction at PERRY, they actually refurbished the existing PRR signals, giving them a fresh coat of paint and replacing the pole lines and power supplies. Well it appears that the reprieve is over as new signals have been spotted at CP-TOME in Port Deposit as well as the former MINNICK interlocking, not reduced to an automatic signal location. 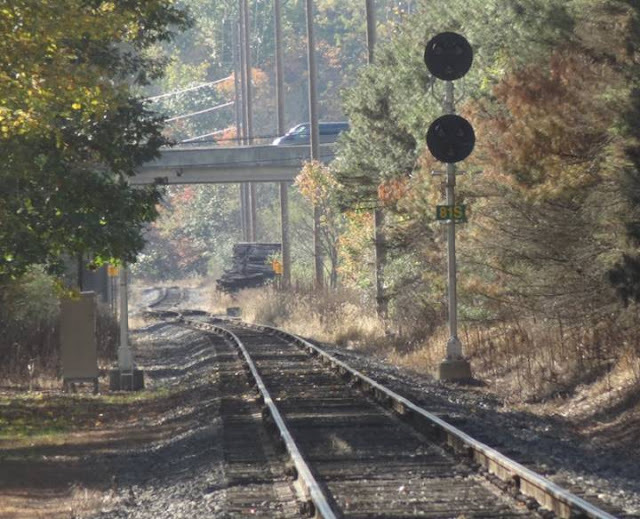 Regulatory filing had indicated that NS was going to convert the entire Port Road to Rule 562, but it appears that the Minnick automatic will be retained to give trains approaching Amtrak territory at PERRY if they have a signal pulled up or if they should coast along at a walking pace. I should also note that CP-TOME, CP-QUARRY, the former CP-MINNICK and Amtrak PERRY interlockings were all back to back, so in theory Rule 261 could be run from from CP-TOME eastward without needing any additional expense. I guess we'll see what happens. Just a quick status update from the Queens Boulevard Line in NYC. As I previously reported, the NYCTA was closing towers along the line as part of a general move away from manual interlocking operation on the IND division. At that time Roosevelt Ave tower has closed with Continental Ave and Union Turnpike close behind. Well as of Veterans Day there has been some good news and bad news. The bad news is that not only have Roosevelt and Continental both closed, but both classic interlocking machines, a GRS Model 5 and US&S Model 14, have both been removed and the spaced converted into employee hangouts. 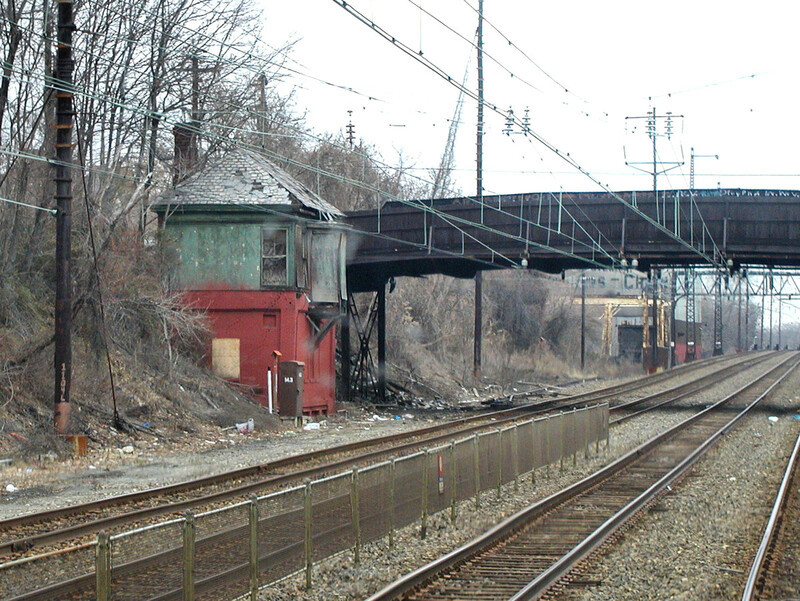 The good news is that Union Turnpike is still in operation along with the small tower at Northern Boulevard on the local branch of the line. That small tower operates a single trailing point crossover with a 12-lever GRS Model 5 machine. In related news, color light dwarf signals continued to appear in the JAY interlocking complex on the LIRR, one even being at the end of a platform. As mentioned previously they are bare stacks of Safetran clam shells instead of something sensible like an LED searchlight. DUNTON interlocking is so far unaffected and both VAN and BROOK interlockings are also not exhibiting any changes. 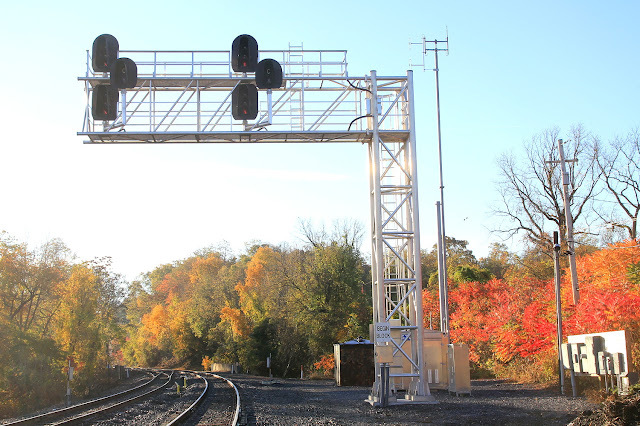 The temporary pedestal automatic signals are still in place at Woodside and I recommend anyone in the area try to get out and photograph them before the new color light signal bridge is activated for the East Side Access project. One upcoming opportunity will be for this year's Holiday Nostalgia Train, which will be providing runs between 2nd Ave and 95th St on the Second Avenue Subway instead of to Queens Plaza. I highly recommend it! Well it looks like the Duke Nukem Forever of re-signaling projects has finally run its course. While The venerable DOCK tower may have been celebrating its 80's birthday this year, the project to replace it was well into it's second decade. 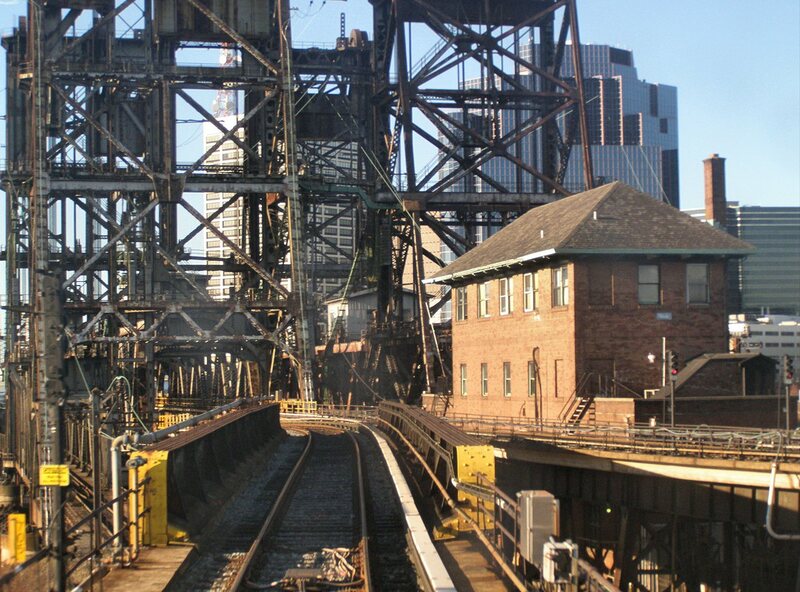 DOCK was built along with the equally magnificent Newark Penn Station and sat just to the east where it could oversee the operation of three movable bridges over the Passiac River. An impressive structure it sat three levels about the track with the ground floor housing control equipment for the bridges' power supply. 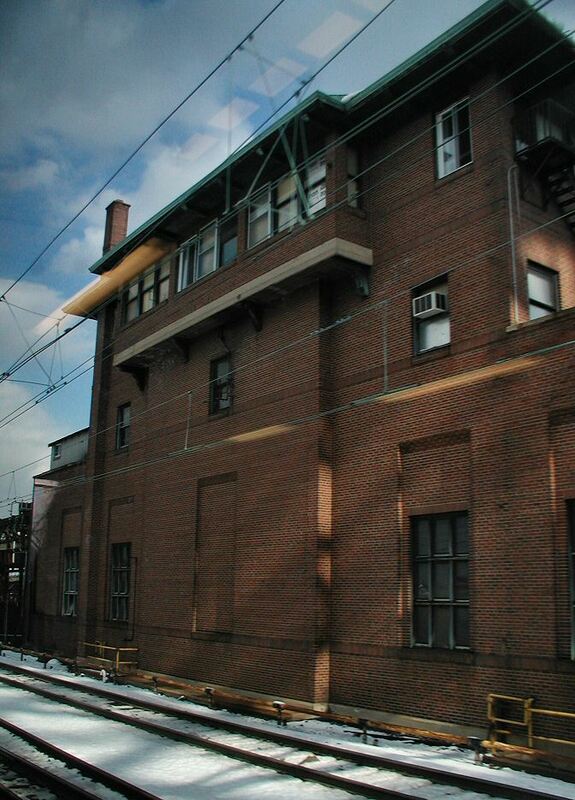 The last of the main line NEC towers, DOCK had previously run as a trio with UNION to the west and HUDSON to the east all the way into the early 21st century. Even after HUDSON closed in 2003, the team of DOCK and UNION had remote control of every interlocking between them with trains being "paper" dispatched from the Section B dispatcher in NYC. Ironically the height of DOCK's power came in the mid 2000's when it was given control over LANE, HAYNES, HUNTER and CLIFF interlockings to the west and REA interlocking to the east. In fact the tower was staffed by no fewer than 5 people during the peak periods, a Train Director, three levermen and a telegrapher. Together they worked a series of modern unit level panels on either side of a large 155 level US&S Model 14 interlocking machine. 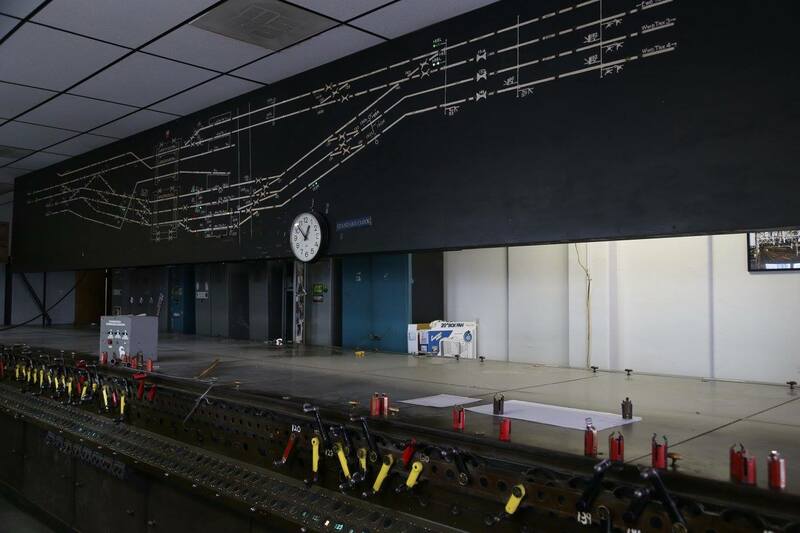 Because of DOCK's importance and traffic density, the re-signaling programme had to proceed very carefully. Slowly colorized signals replaced the PRR amber ones, electric points replaced the pneumatic ones. DOCK's extended territory was transferred to the Section B dispatcher and finally on Armistice Day 2017, the whole operation was shut down. While I doubt the tower will be demolished, I am not sure of what exactly it's function will be. C&S hangout or will the bridge tenders still show up from time to time to raise and lower the three lift bridges? So I wanted to do a quick post about the state of the blog. You may have noticed that a lot of the links and photos (at least more than usual) are broken. This is because over the last 12 months I first lost my backup web hosting due to Chinese web crawlers and then lost my main web hosting due to a thermal event. Fortunately I had had long since adopted a policy of using Google Photos to host the images presented directly on the pages, but some of my early essays relied entirely on the private server (along with all direct links). So while my private web hosting is likely to be out of commission through Christmas or possibly January, I am using the opportunity to go back through and convert all the major photo essays into using Google Photos. I'm pretty much starting at 2011 and working back with the PRR Main Line Survey and METRA Tower Survey getting first priority. I am also using this to fix any other problems with the pages like factual errors or omissions (for example on the Main Line Survey I completely forgot CP-UN). I am NOT updating the pages to reflect current reality, they will remain creatures of their time. Also, if someone needs any particular page fixed sooner, again message me and I'll move it to the front of the line. Thanks for all your support over the years, I really appreciate it! A local Toronto newspaper posted a neat tour of SCOTT ST interlocking tower and its 1930's vintage GRS 5B Machine. The 5B's were the last iteration of the GRS nee-Taylor "pistol grip" style interlocking machines and was typically used in only the largest layouts due to its extra beeft lever-slides and, as you can see from the video title card, the ability to enter the machine itself for maintenance. 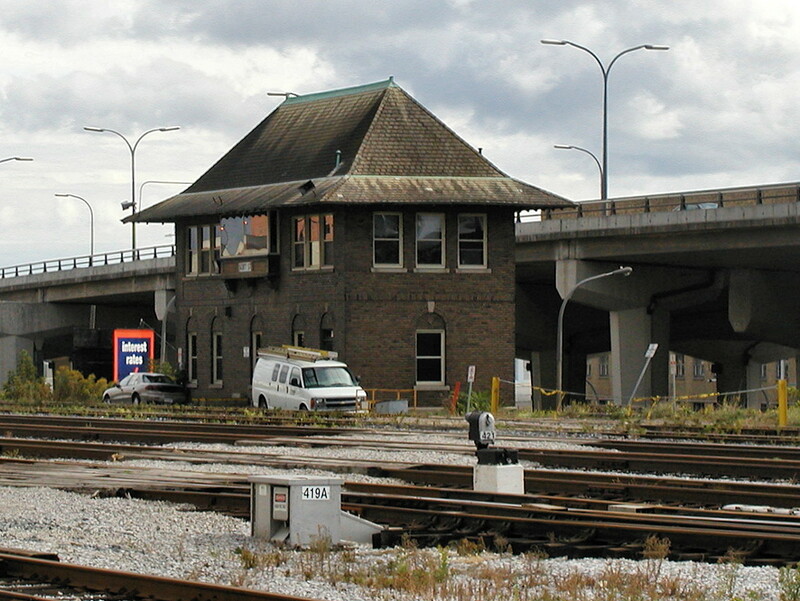 The three towers of the Toronto Union Station complex, JOHN ST, SCOTT ST and CHERRY ST, are part of the too big to fail club along with TOWER A-2 and CNW LAKE ST. However for the last decade or so even these largest, busiest towers have been falling due to the general allergy of employing human workers. The video itself mentions that SCOTT ST is scheduled to close in 2019. Fortunately I was able to get some photos of it back in 2002. Unlike a lot of surviving towers, like METRA 16TH ST, the Toronto GRS plants have been kept in very good condition and you can see from the video that the interior doesn't look especially antiquated. Who knows, maybe they will get turned into some sort of living tourist attraction like HARRIS. 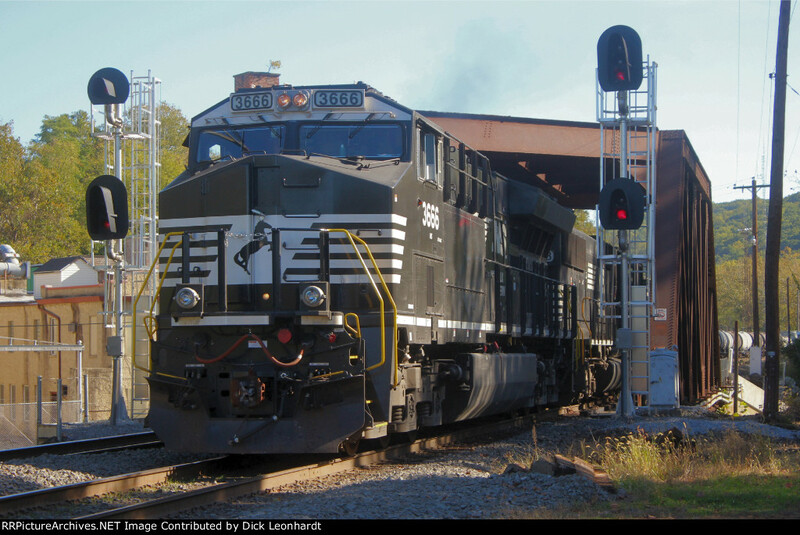 I just learned from a contributor that the famed B&O CPLs at HAMILTON interlocking in Hamilton, OH were cut over this past weekend. One can also assume that surrounding CPLs have also been replaced. Unlike the Broadway show there will be no touring production. In other bad news, replacement signals have gone up at CP-ROCKVILLE and CP-HARRIS, which so far has seemed immune from NS's PRR Main Line signaling blitz. The "new" PRR PLs at Rockville will be an especially hard loss. 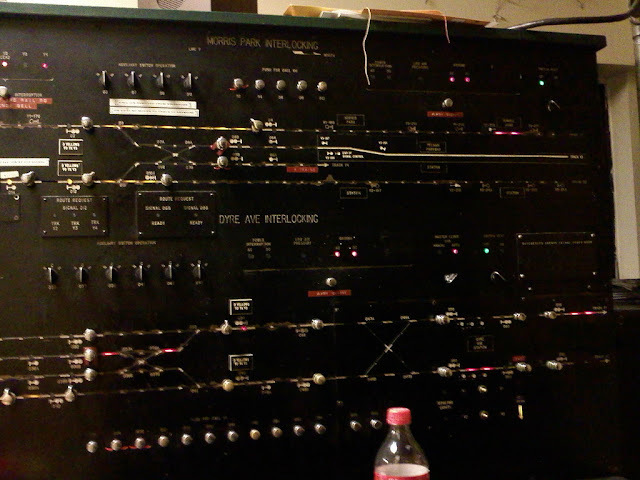 The signaling dates from the late 1980's. I can also report that the pneumatic point machines have been replaced by electric M23's at CP-HUNT and on the former N&W H-Line, the last bunch of PLs on the northern segment have also fallen. Finally, the new signals at CP-ALLEN have cut over, replacing former Reading searchlights. Status of the eastern Reading Line Rule 251 ABS is unknown at this point. Wrong railing no more. West on former E/B tk 2. 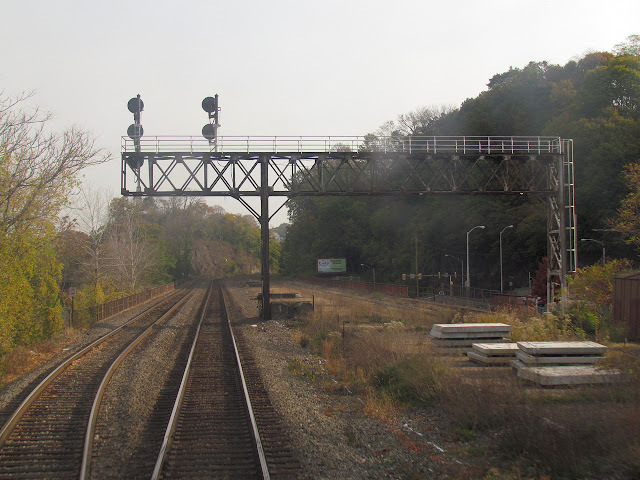 The METRA commuter rail network has been seeing a lot of re-signaling as of late, but there is still a lot of interesting stuff out there like searchlight signals, CNW signal bridges, ATS shoes, Rule 251 operation and a few open and closed interlocking towers. 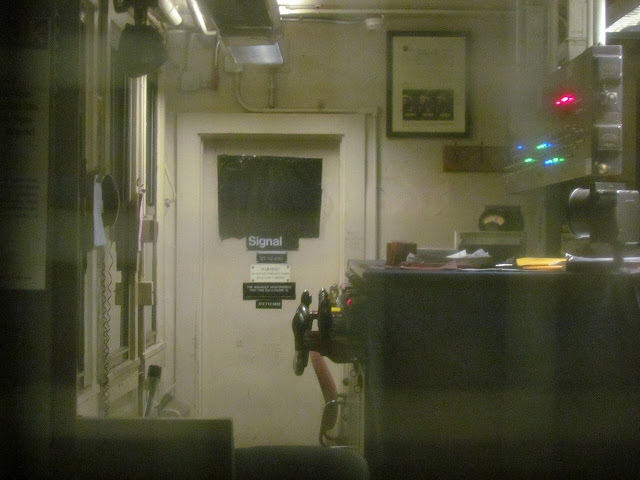 Thanks to METRA's use of gallery cars there are quite a few railfan window videos from METRA trains floating about on YouTube, however earlier this year a new source came on the scene, METRA itself. Taking a cue from Chicago's CTA, METRA has embarked on a project of creating HD head end videos of all its major commuter routes, both inbound and outbound. While they aren't the most exciting (no effort was made to video express runs) they do capture the current state of the signaling hardware as well as live signal behavior (as opposed to everything just displaying Stop). The videos are going up every few weeks. I am looking forward to the UP West and UP North lines as both of those have a lot of surviving CNW features as well as ABS operation. I am sad to report that one of the least visible (and least structurally sound) towers on the NEC was just swept into the landfill of history. 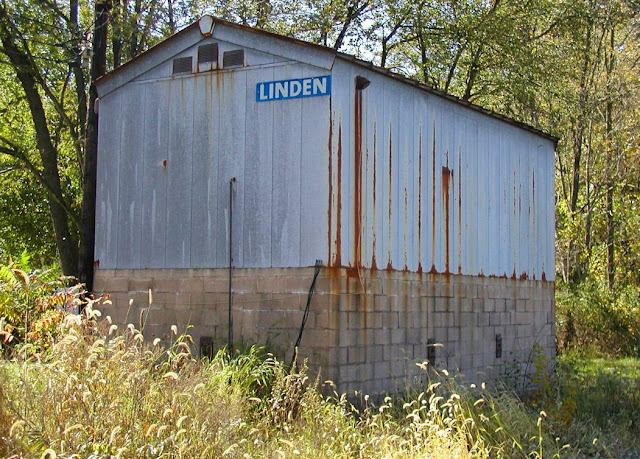 LAMOKIN was located at the junction of the old PRR Chester Creek Branch between the presend day BALDWIN and HOOK interlockings. LAMOKIN was closed in 1972 when the lightly used Chester Creek Branch was done in by Hurricane Agnes. 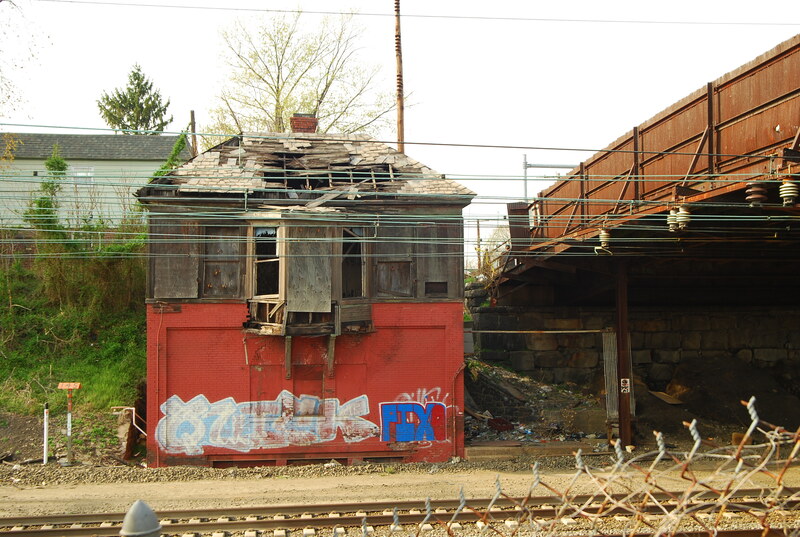 Since then it has sat, decaying, along side the NEC,hidden from the north by the equally historic Lloyd St Bridge. The tower, built as near as I can tell around 1900, is similar to PAOLI, BRYN MAWR and CLY with a brick base and a wooden operating floor. The slate roof had completely deteriorated and it was only a matter of time until the tower burned down or collapsed. When it was open the tower controlled a trailing point ladder that allowed access to the Chester Creek branch to and from the north. The machine was an electro-pneumatic type and you can see the remains of the air plant in the above photo. As I rarely had a reason to be in the area I never got a good set of photos of the tower and although I passed by on Amtrak many times a year, it was always out of sight and out of mind. Just poignant reminder to always get photos of interesting things while you can. LAMOKIN in 2002, still showing its PC Green and a bit more roof. I had a couple of NS signal alerts I wanted to share. The first is that apparently the cut over on the Ohio portions of the Nickle Plate Line is fast approaching so go get your photos while you can. I also heard that new signals are now up at CP-CANAL and CP-JU on the Reading Line, east of Allentown Yard. On my previous trip back in May, both of those interlocking were as up yet untouched. The new eastbound NS signals set out for CP-BANKS are not set up for Medium Approach Medium on tracks 2 or the siding, nor is Approach Medium available for track 1. I suspect that NS is using the new cab signal only operation to restore the additional block and improve capacity at modest cost. 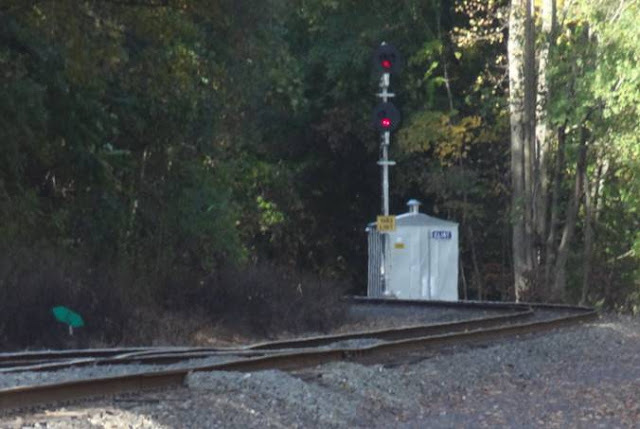 In fact I have seen a number of new relay huts away from current signal locations or grade crossings so NS could be trying to actually get something out of the new signaling system apart from lower costs. 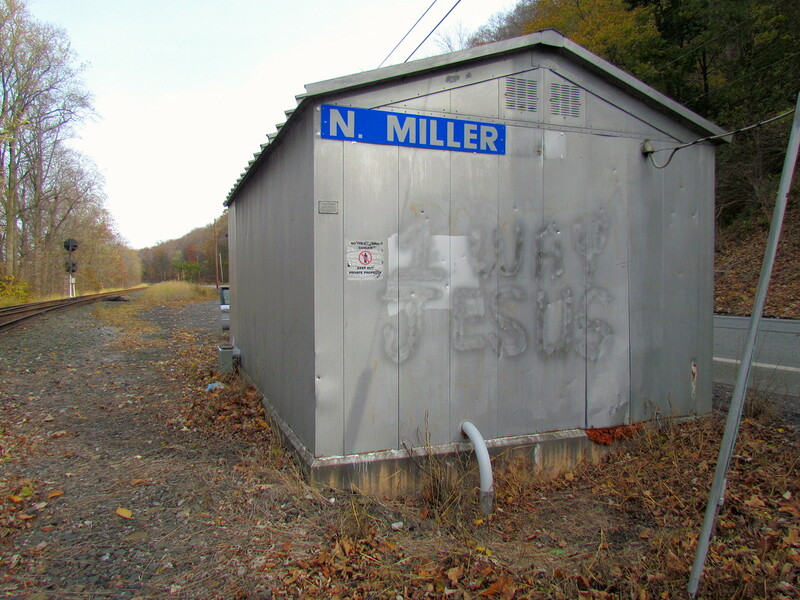 So a number a years ago I was planning to get some signal photos along the former Conrail Buffalo Line and while searching for information on CP-NORTH MILLER, I noticed something strange about the results. It appears that, for some bizarre reason, the telephone in the signal house at CP-NORTH MILLER had gotten itself listed in a phone book at some point and now it was plastered all over various cyber-leech clickbait websites. Normally I might not have given this a second thought, but for another poignant experience I had way back in 2006. On another Buffalo Line trip, while taking photos at CP-LINDEN out of the blue an old style bell phone began to ring inside the spacious 1950's vintage PRR CTC-style relay house. I had a chuckle thinking who would be calling an interlocking in the middle of nowhere, but when I saw the phone listing for CP-NORTH MILLER 8 years later, I just HAD to try it. The PRR was never very enthusiastic about CTC, content to rest on its laurels of multi-track main lines, manned block stations and the manual block system. However it did green light a few projects and the Main Line between Rockville to Buffalo, was one such example. Installed in 1957, the Buffalo Line CTC was definitely a creature of the PRR with lavish signal huts, a reliable power supply (so no approach lighting) and apparently, a PTSN station in each walk-in signal shanty. So back in 2014 I drove up from Rockville to Millersburg, all excited about capturing a cool intersection of the rail and telephone network communities of interest and...nothing happened. I tried the number and the phone didn't ring. Ah well, should have known it wouldn't have worked. Fast forward to 2017 and I was back up again, chasing signals on the Buffalo Line and I just couldn't help myself to pull over and see if I could give the call another go. At this point I'll cut to the video. Man, what ever happened to that wonderful rich 1950's ringer sound? Absolutely wonderful! I'm going to go out on a limb and say I'd bet it was a wall mounted Western Electric model 554. I don't see the PRR sticking a desk set in such a cramped location, nor do I see Conrail or NS ever having upgraded the line for DTMF service ;-) Of course a Western Electric rotary phone is probably even more reliable than the US&S glass case relays powering the interlocking logic. In Europe, mechanical signaling is still quite common. 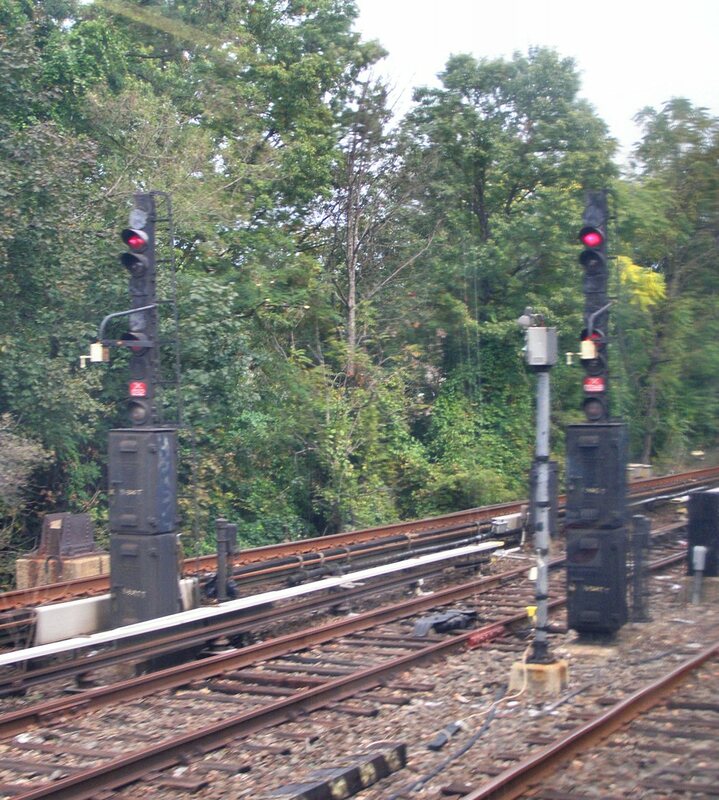 Paired with the manual block system, all or nearly all-mechanical interlocking towers control thousands of miles of main line track. 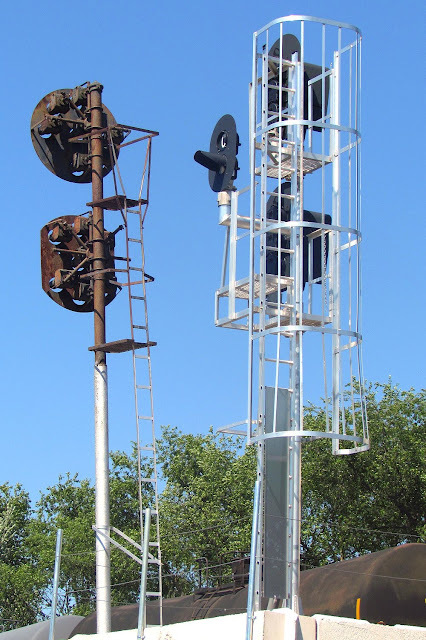 However in North America, the all-mechanical tower, that is with semaphore signals controlled directly by levers and pipeline, is virtually unheard of . Yes examples can be found at drawbridges and diamond crossings on low density track, but the difference is quite stark. Part of the reason is the general incompatibility of automatic block and mechanical signals. Manual block was much less popular in North American than in Europe. The other reason had to do with a number of ICC regulations that required signals to be interlocked with train detection (read track circuits) and that signals be electrically interlocked with point detectors. You can imagine my surprise when I discovered Neilson Jct in Neilson, IL to have a set of fully mechanical signals controlling a manual block style junction with non-Restricted speed movements. Now RR Signal Pics does a great job providing basic details about Neilson, but I just wanted to not only call attention to that page, but also to a set of videos that have been on Youtube since 2011, but due to poor use of keywords, does not appear on most interlocking tower or signaling related searches. 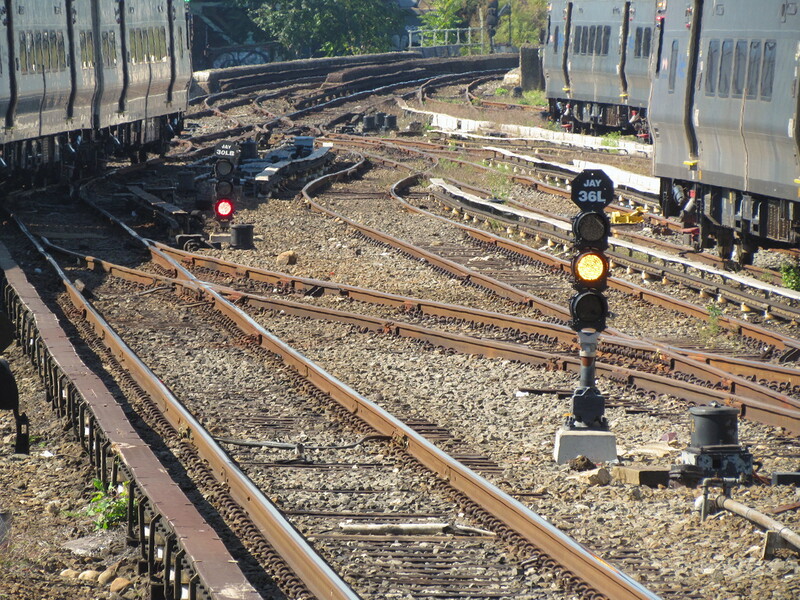 For a single switch between two secondary tracks, Neilson has a surprising number of levers. First, just like in British practice, each former C&EI distant has its own lever. 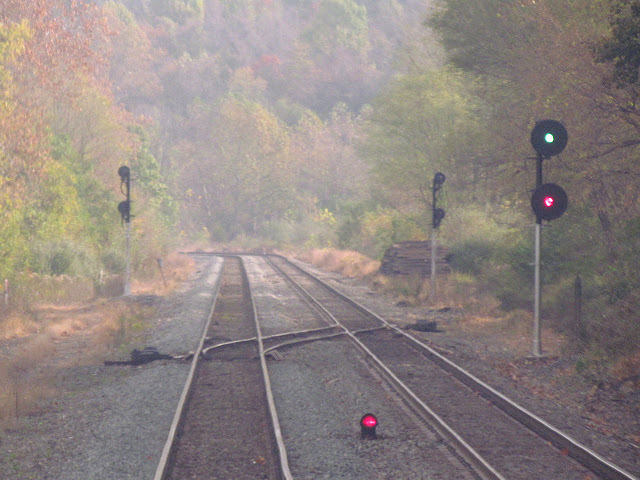 Second, each of the southbound signals are connected to derails which also come with a facing point lock. Finally, the 12 lever operated a mechanical timer that I assume provides approach locking in the absence of track circuits. The northbound home signal handled the route route selection issue by having two semaphore heads, each controlled by a different lever and indicating one of the two routes. 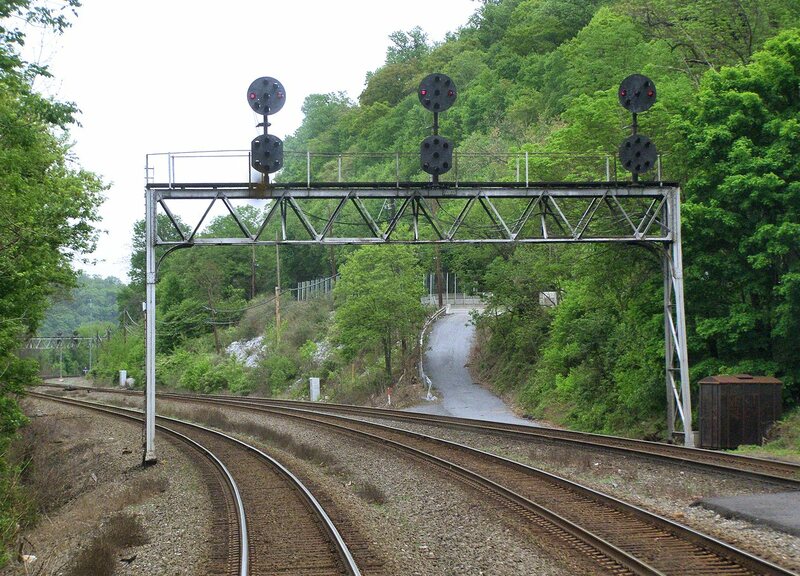 Of course the straight route semaphore was for the C&EI and the lower diverging route semaphore for the BN. Aside from the British style of operation, what really puzzles me is how such a tower survived up through 1989. Checking Google Earth it appears the single junction switch was replaced by a hand operated type and that the line is un-signaled. 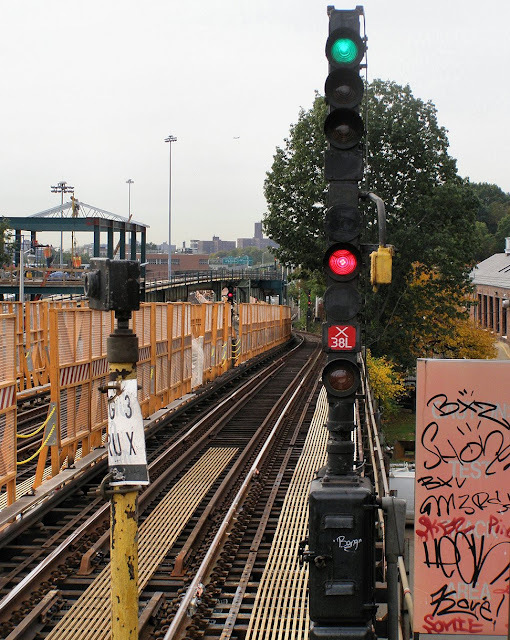 One of my earliest posts for this blog back in 2011, covered the closing of the NYC Subway's E. 180th St interlocking tower. This was the last instance of an electro-mechanical single interlocking tower on the IRT division and also what I thought at the time was the last bastion of old IRT signaling as well. You see, in addition to it's on interlocking plant, E. 180th St tower also had CTC control of the (5) Dyre Ave line. It seemed logical that closing the tower would be followed by a re-signaling of the Dyre. Well it turns out I was wrong and the old IRT signaling on the Dyre persisted for another 6 years! Unfortunately, I was just informed that the NYCTA would finally be concluding it's closure of the E. 180th extended enterprise by cutting in a new, bog standard IND style system on the Drye on or after Labour Day 2017. If you want a full explanation of IRT and IND/BMT signaling, you can find it here, but the short explanation is that the IND/BMT system uses the upper head for block occupancy and the lower head for route. So a G/Y signal would be Diverging Clear and Y/G would be Approach Straight. 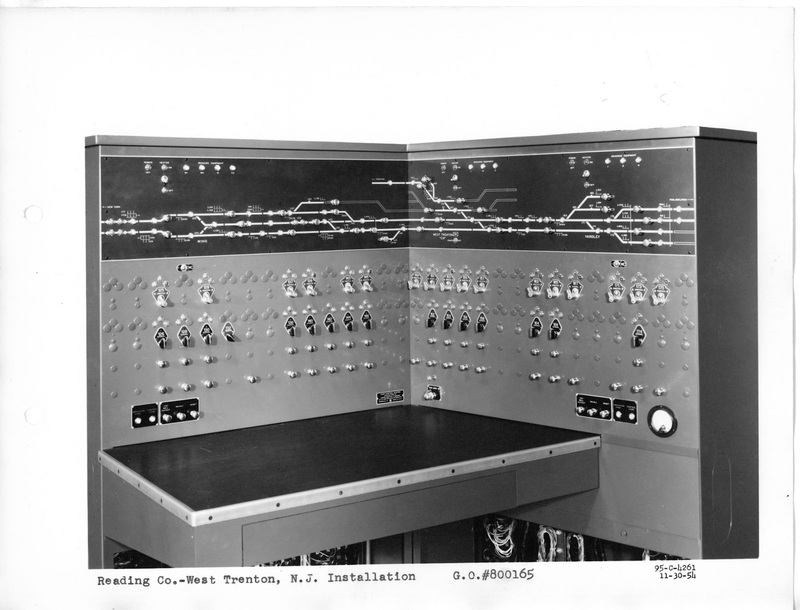 The IRT used a more railroad style system with each head representing a different route. R/G would be diverging clear, etc. Basically something that would be familiar to almost any real world railroader. The NYC Subway marked old IRT signals with a red number plate and outside of the Dyre they were last seen on the (2) and (4) lines in the Bronx up through the turn of the Millennium. While I guess it was a good thing that these signals survived 6 more years that I had assumed, I'll definitely regret not taking the time to go up and see them beyond my last visit in 2009. 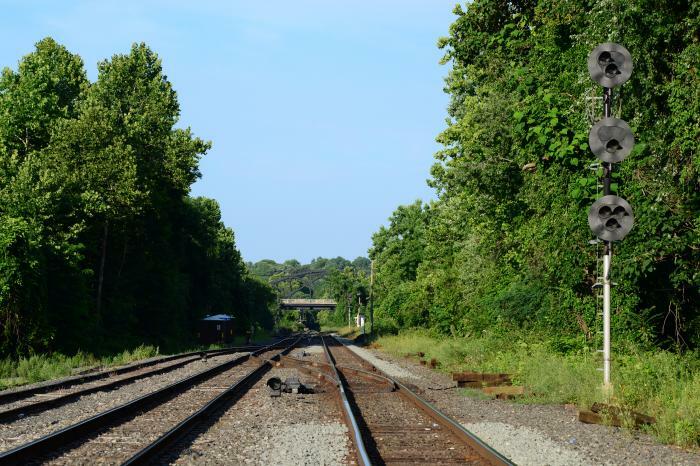 There are some changes afoot in the Perryville area on Amtrak's Northeast Corridor. To start, about a month ago I received this rare bit of good news about changes to GRACE interlocking, which featured Amtrak's brief operational test of Conrail style tri-light signals. 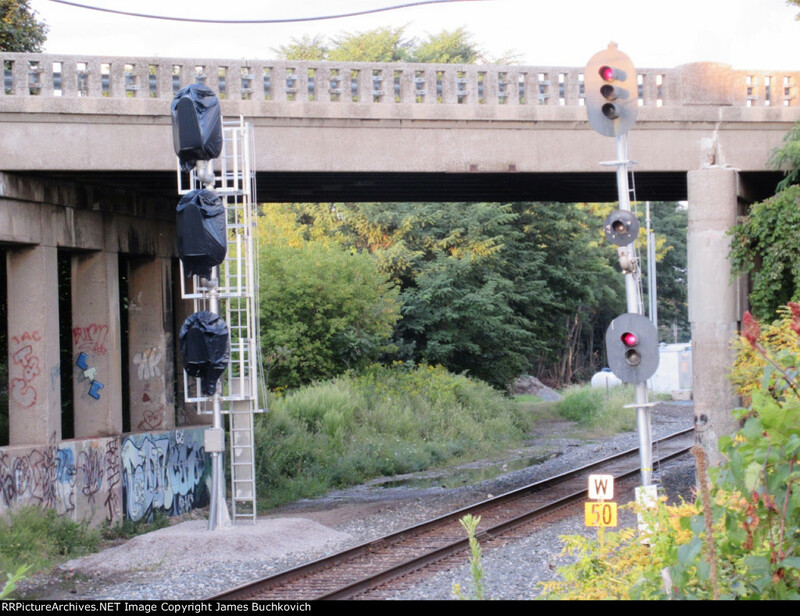 Well turns out the experiment is over and Amtrak is replacing them with colorized position lights. So thumbs up emoji! Unfortunately, Amtrak isn't stopping there. 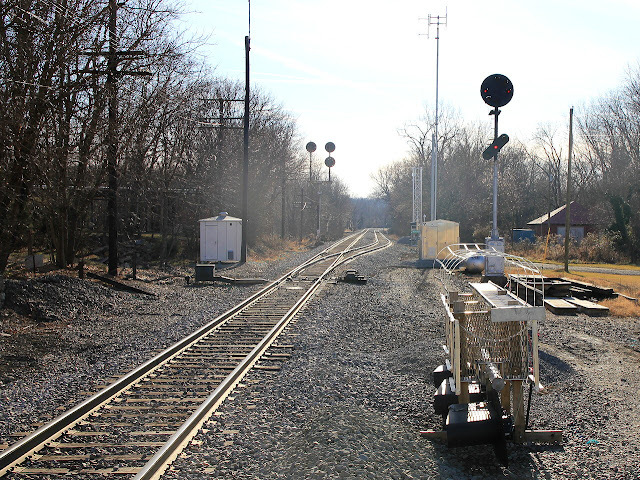 It turns out they are also replacing the main line dwarf and pedestal signals at PERRY interlocking with CzPL masts. I have to assume this is motivated by the 562 project that was reported to be going in between PRINCE and RAGAN as the new mast have 'C' boards, however unless Amtrak is looking to expand track capacity with extra ABS blocks, the "Clear to Next Interlocking" indications are completely unnecessary as the NEC between OAK and PRINCE is comprised entirely of back-to-back interlockings! Did someone retire because you folks used to do this the right way with Rule 261 or Interlocking Rules replacing 562 in instances of back-to-back interlockings. Maybe someone thought that a 'C' lamp couldn't be attached to a pedestal or dwarf signal, but Conrail had no problem fitting 'C' lamps to PL dwarfs at CP-MA on the Morrisville Line. Since the new signals are being spliced in, not going up in parallel, the typical "testing in parallel to save money" does not apply. No position lights are always nice, but IMHO these full sized masts just look ungainly. In electrified territory the signals should be up on gantries or it just looks half assed. 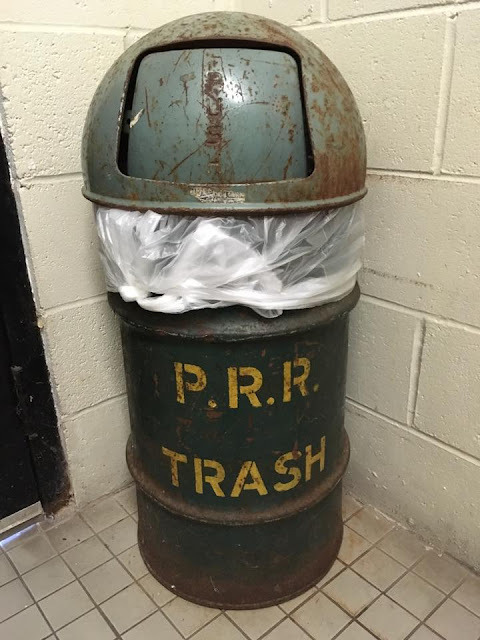 WWPRRD!